This 120 inch 16:9 Portable Tabletop Projection Screen is the most compact and travel-friendly option for small meetings and mobile presentations. This unique projector screen allows you to set up quickly and easily on anywhere! 2.you can use iron but not too hot. High Brightness .Lightweight and compact one-piece design.synthetic fiber white screen material eliminates light penetration. 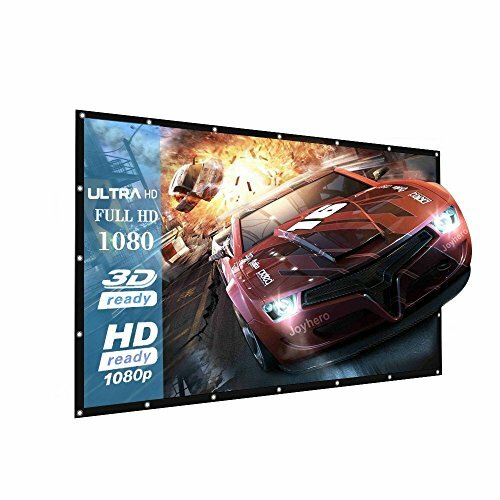 Perfect for handheld projectors.Suitable for home theater, business meetings, exhibitions, conventions, presentions, etc..
Warranty:Joyhero screen provide one year warranty and customer service, if the product have any question, Please send email to us.Thank you ! If you have any questions about this product by Joyhero, contact us by completing and submitting the form below. If you are looking for a specif part number, please include it with your message.